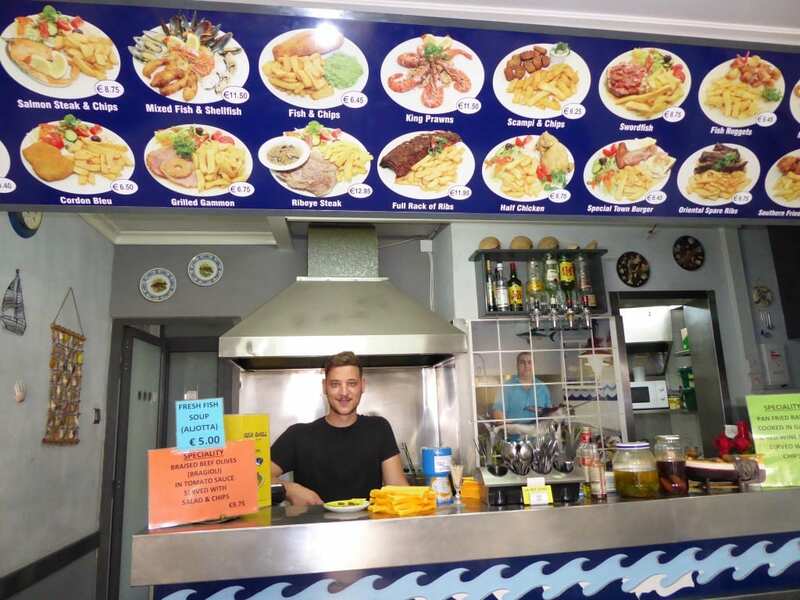 Home » Comments » cookery » Countries » Europe » Featured Articles » tours » Travel » The Sea Shell, Maltese Hidden Pearl of a Restaurant! The Sea Shell, Maltese Hidden Pearl of a Restaurant! 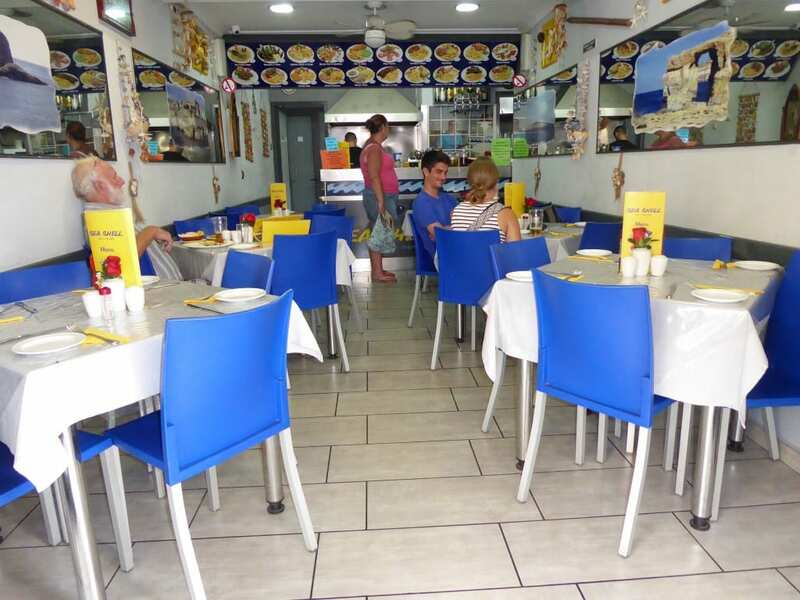 Lyn Funnell stumbles on a little gem of a restaurant on a recent visit to Malta. Hungry, hot and thirsty, Hubby John and I walked through the streets of Qara in Malta, looking for a nice place to eat that wasn’t too commercial. We walked past the Sea Shell Fish & Chip Shop twice with hardly a glance. It was small with around six tables. The prices were ever so cheap, with dishes displayed outside on photos, so we immediately assumed the food would be basic and frozen. Finally we agreed to go in and give it a try. The place was immaculate and the menu prices were indeed very cheap indeed! 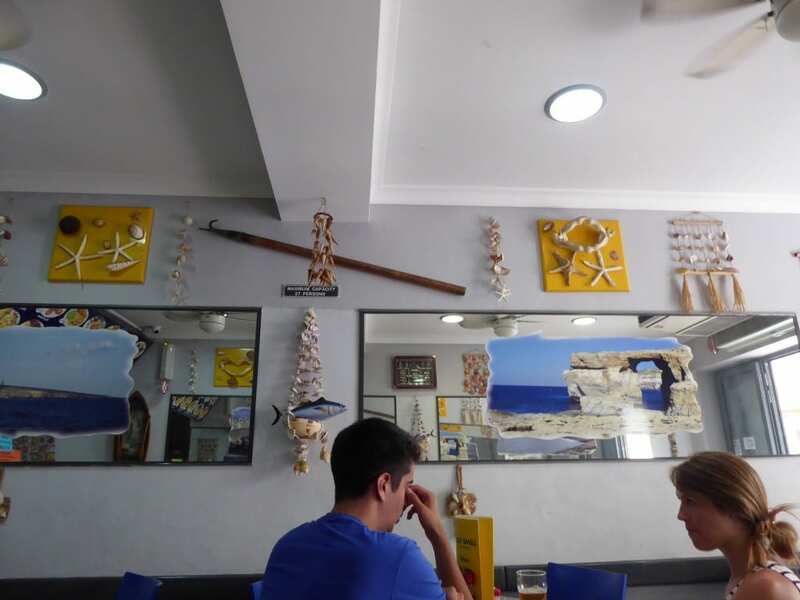 The décor is beachy, blue with shell crafts hanging from the walls. First, we ordered two Cisks, the refreshing Maltese lager. 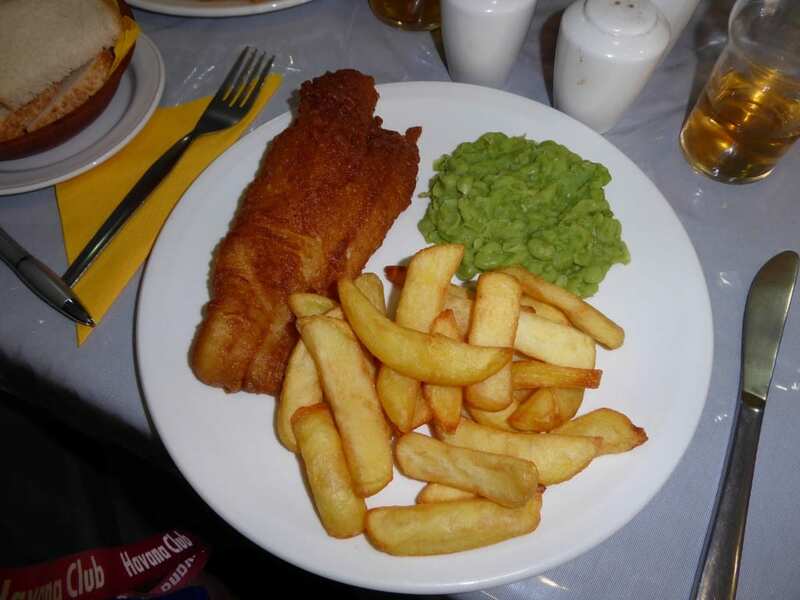 John chose cod, chips and mushy peas, 6.75 Euros. The cod was frozen, imported from Spain, then coated with a fresh crisp batter. He said it was delicious and tasted fresh. 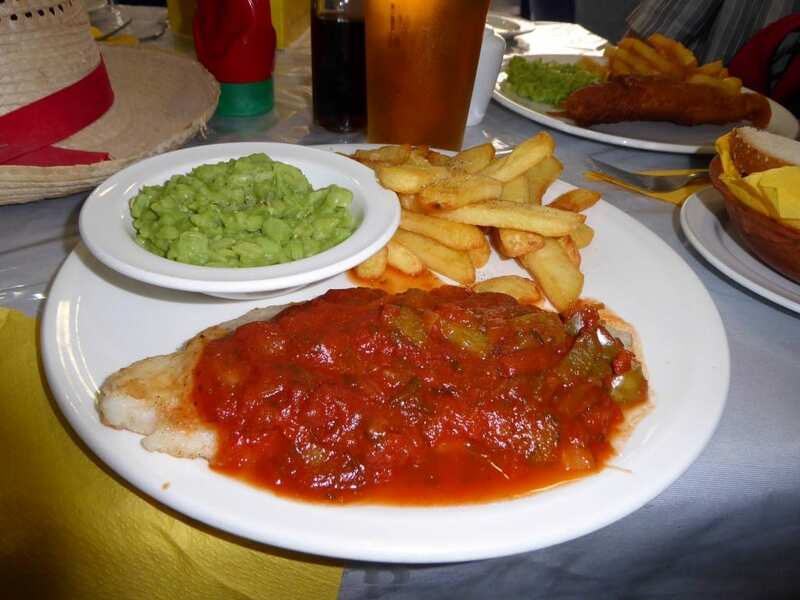 I had cerna which was fresh local dusky grouper, served with a sauce of tomatoes, peppers and more, mushy peas and freshly made chips. Cerna, pronounced cherna, is a delicate fish, served as a thin steak with no bones. Both meals were perfection, and a little bit more than we could manage. They took about 10 minutes to arrive, which is just right for fresh food. 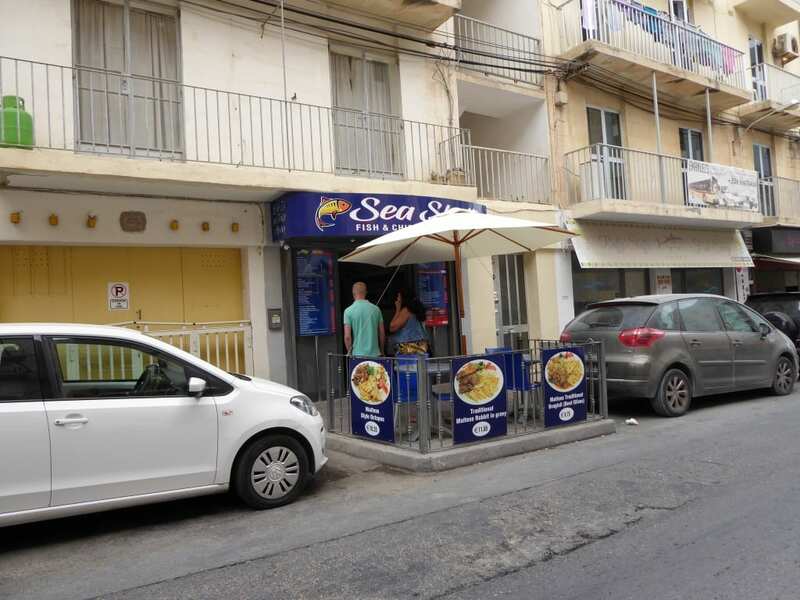 Jan Magro, the owner, runs the Sea Shell with his Mum. He’s young, single, friendly and good-looking, and a good cook with his own successful business. Don’t all stampede at once, girls! His father, Manuel started the business 20 years ago with his partner Mario Pisani. Both men have now retired. But Manuel can be happy knowing that his business is still going strong and being well-looked after! I award the Sea Shell 10/10 for perfection. If you’re in Malta it’s well worth a visit or two. The Sea Shell is a couple of roads in from the sea front.